The first community defibrillator is now available on the wall outside the newly opened Co-operative Store in Lincoln Road. This has been provided in a joint scheme with the East Midlands Ambulance Service (EMAS) and the Lincolnshire Co-operative Society. It is ideally placed where it is visible to all who may need it and the code will be provided when 999 is alerted so that it can be used while waiting for Emergency Services to arrive with professional help. Every second counts following cardiac arrest and while training is available, the defibrillator leads the user through the procedure and cannot do any harm. 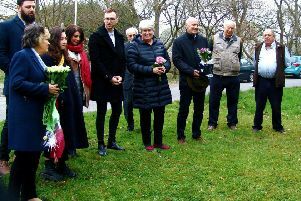 Following a talk and demonstration last year by Steven Hyde, of LIVES, it was agreed there was a need for at least two in Wragby. There have been generous contributions raised in various ways and it is hoped two more defibrillators will follow shortly when more pledged donations come in. It has been suggested one is needed at the Horncastle Road end of the town and possibly one in the Louth Road area. Fundraising events are planned and LIVES are supplying envelopes to enable a leaflet drop to every household, to ensure everyone who wants to can contribute easily to the Defibrillator Fund. An event will be held on Friday, May 27, with details available shortly. Meanwhile, Barbara Bartlett will be pleased to accept offers of help; she can be contacted on 01673 857480.